How many dry fly patterns do you need for the stream? This is a little like asking how long is a piece of string. The obvious answer is of course as many dry fly patterns as you need. The problem is every fly fisher has his own personal idea of how many that is. Some may carry literally hundreds of patterns whilst others may carry only half a dozen dry fly patterns. I'm firmly in the latter camp but when required I'll tie up patterns for a certain hatch. 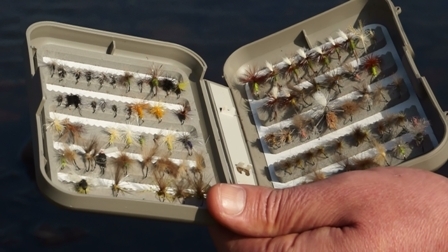 The early season dry fly box! Stream dry fly patterns are generally tied to represent aquatic insects usually mayflies or caddis flies or terrestrial patterns. The latter end up in streams particularly during warmer months and can be a major source of food for the trout. The following clip illustrates the different types of stream dry fly. This clip was taken in the early season when small mayflies (large dark olives) were hatching. The clip shows the flies both natural and the artificial dry flies that copy it. The pale hares ear CDC upright featured in modern dry variations was the fly that got the fish! 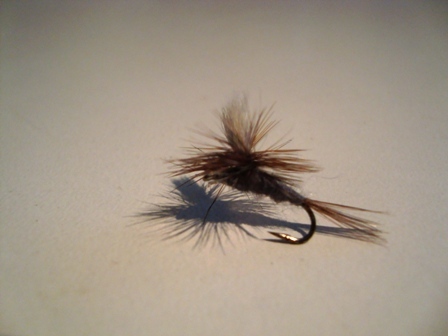 The parachute Adams - a good general all round stream dry fly. Generic patterns are for the main part as good or even better than those tied to represent a certain fly. The Adams is a classical example. What does it represent? Everything and anything from mayfly to stonefly to caddis. It generally represents everything very well but nothing exactly. Its shape and profile are the triggers for the trout that this is something edible and worth eating. Therefore on most streams and most of the time it will be a very effective dry fly. The "F" terrestrial- A superb fly in high summer when bugs abound! My standard terrestrial patterns are the "F" terrestrial and the Griffiths gnat shown. The F terrestrial I can tie fatter or thinner to represent beetles or flies. It is fantastic fished in high summer under the branches of overhanging trees. Trout are the ultimate opportunists and wait for meals from the sky in such locations. It is a very simple fly to tie and always effective in the right conditions. The Griffiths gnat is a great standby when trout and grayling are feeding on tiny black specs about the size of this full stop. But between them these 2 flies will do an excellent job of representing most small black bugs beetles and flies most of the time. The odd time I need a special pattern like in a hawthorn fly I will tie a few up. Of course the fact that trout quite happily take a traditional pattern like an Adams does not stop fly fishers producing more innovative patterns. Trout in streams that see a lot of fly fishers become very wary of dry flies. Indeed whole episodes such as Goddard's "the Educated Trout" are devoted to this. Swisher and Richards "Selective Trout" was the first book that looked in detail at improving dry fly patterns. 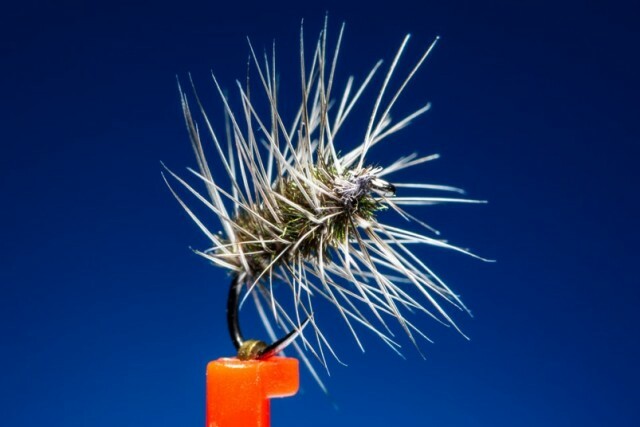 The no hackle flies and other patterns they produced revolutionized fly fishing and fly tying. Selective Trout became the best selling Fly fishing book of all time and rightfully so. Matching the hatch was suddenly in vogue. The creative fly tier and fly fisher could tie much more accurate and representative patterns than ever before. The pale hares ear mayfly pattern illustrated is largely a result of combining CDC with Swisher and Richards no hackle dun. I've found it to be a great fish taker in streams from the Himalayas, Colarado, Alberta Canada, the Czech republic and the rivers of the UK. 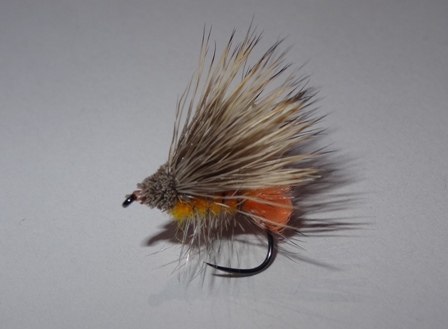 It might be argued that no hackle duns are in fact emergers or flies with wet bottoms. They are effective because fish see emergers as an easy target, especially an insect that is trapped in the surface film. Swisher and Richards took this to its logical conclusion by tying patterns that represented cripples or failed emergers. In any hatch the observant fly fisher can see flies with wings trapped in the film- struggling frantically to break free. Trout candy. The Klinkhammer is a modern river fly that epitomizes an emerger. Most of the body of the fly is under the water surface and supported by a parachute hackle. It was a fly that grabbed the attention of both fish and fly fishers. As a search and find fly it proved very popular. Large catches of grayling, trout and sea trout were widely reported using the pattern. It is often used to suspend a nymph underneath it and used as an indicator dry. This modern river technique is often called the "duo". When a nymph fished specifically with a Klinkhammer dry fly the term "Klink and Dink" is often used. Parachute dry flies like the Klinkhammer are a popular modern alternative to traditional hackled flies. The profile of a parachute hackle is far more realistic and the body of the fly hangs enticingly just below the surface. 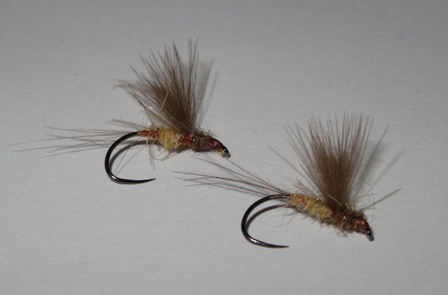 Parachute versions of old classics like the Adams are extremely good effective all round dry flies. 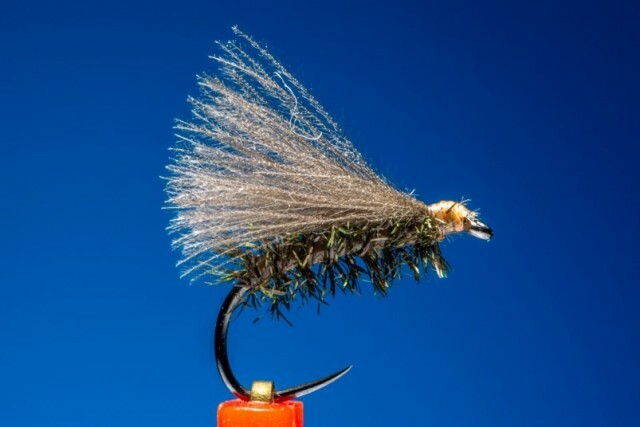 In the next link we will look at a soft hackle dry fly. These flies are outstanding and are currently the first fly I will tie on by the stream.